I fell in love with Galaxy when I saw him license in Holland and I am so pleased I paired him with Bugatti! 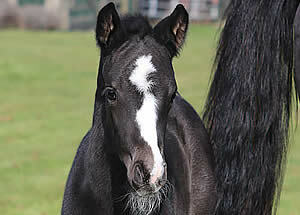 The result is Larkshill Karisma, an absolutely breath taking black filly who is so charismatic! She is a real beauty with the most exquisite head, superb conformation, powerful elevated paces and an excellent hind leg. Karisma has exceptional breeding ALL the mares in her immediate pedigree are “Elite” many of whom also have the Preferent and Prestatie predicate too – how rare is that. This filly is top class and we hope she will follow in their footsteps and become Elite in the future! Galaxy is an ultra-modern, lustrous black stallion by Apache, the KWPN Grand Prix stallion. In fact, Galaxy went from the KWPN licensing in Holland to Denmark and in exactly one month later went on to be proclaimed the Danish 3yr old licensing dressage Champion! He was the crowd favourite, and obviously favourite of the judges too - he scored 9's for his head and neck, shoulder, back and loin, and canter, and overall impression. Galaxy boasts an exceptionally predicate-rich dam-line full of elite mares. His dam Winner T is a National Mare Inspection mare by the legendary Jazz.. She competed at the ZZ-light level and carries the elite and sport (dres) predicates as well as the predicate Preferent on the basis of her offspring. Her dam Magnaat is an elite preferent prestatie sport (dres) mare by Zeoliet and a Z2-level competitor. She also produced a Z2 dressage horse by Goodtimes, two ZZ-light horses by Jazz, and a Prix St. George by Jazz. The dam-line continues with the keur preferent prestatie sport (dres) mare Fanaat, a daughter of the Grand Prix stallion Aktion out of the keur preferent prestatie mare Nataly by Irco Polo. Winner T (by the legendary Jazz) has already produced a full-brother to Galaxy, the Prix St George stallion Volvo. Sire: Grand Galaxy Win T ....,,,,,,,,,,,.......Sire: Grand Galaxy Win T,.....,......,...BDam: Elite Bugatti ST ..